Which side of the naughty/nice list are you on? Bolt the doors and block the chimney! This Krampus Christmas elf stands over 10-inches tall! 1:6 scale statue sculpted by Jamie Beswarick. Bolt the doors and block the chimney, because one of Krampus' Christmas elves is here! This creepy holiday henchman takes great joy in his work, giggling and laughing as he wraps and traps his victims in chains and bells. Measuring about 10 1/5-inches tall x 8 2/3-inches wide x 7 9/10-inches long in polyresin, the Krampus Dark Elf #2 1:6 Scale Statue is sculpted by Jamie Beswarick. 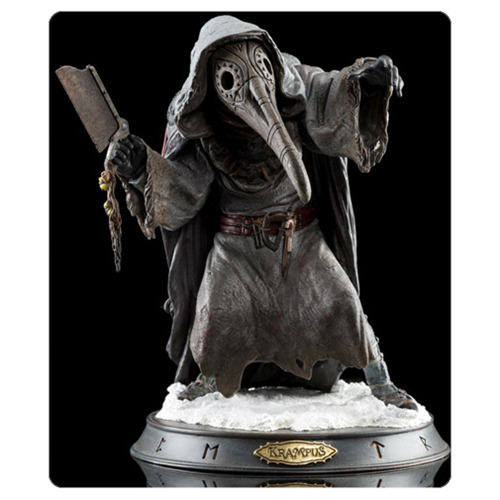 This unsettling cloaked character features a plague mask and a rusty bone saw with rubber duckies on its leather strap. And on his belt? A solitary candy cane. But that's just for nice children. Naughty children better watch out! Which side of the list are you on?